MacX DVD Ripper Pro is rated one of the top DVD rippers in the market today. It provides all the features you need for a fast and clean DVD rip. Tests indicate that this software beats its competitors by a good margin when it comes to fast ripping. In addition to great speed, the output quality is also top rate. The best part is the software is priced affordably. MacX DVD Ripper Pro can rip any protected or encrypted disc and also provides 1:1 copies. Its Trim and Crop features work excellently and the software is easy to operate and gives you full control. The application is ready for iPhoneX/8/8 Plus and its advantages include presets, DVD copy, export options, no quality loss, all DRM defeat, all DVD types, and finally, quick high quality engine. MacX DVD Ripper Pro is a DVD copy tool that you can use to convert your DVD movies into formats that can be played on popularly used devices such as gaming consoles, tablets, smartphones, iPods and others. However, the drawback is the software does not have the capability to burn new DVD discs. A standout aspect is the range of conversion options that are displayed when you launch the software disc. You can rip DVD movies for playing on widely used Apple devices such as Mac computer, Apple TV, iPad, iPhone, and iPod. In addition, the application can also convert DVD movies into compatible formats for widely used video gaming systems, Microsoft Surface, Amazon Kindle, and Android devices. 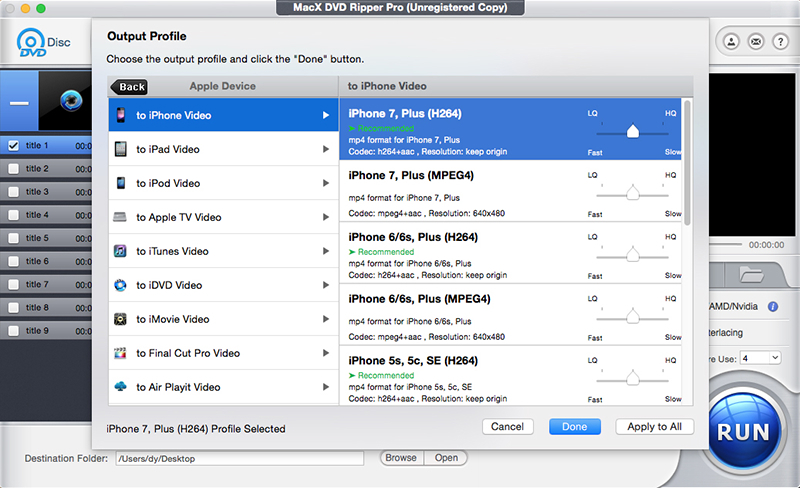 MacX DVD Ripper Pro reviews indicate that all rips are customized for particular device specifications. As a result, the ripped content is of excellent quality and you get an optimized viewing experience on your chosen device. The application makes the playback experience seamless and it is hard to find any drawbacks. MacX DVD Ripper Pro is a great application for casual and average users as it is easy to master. The user interface is simple and you can familiarize yourself with it quickly. After that, it is a breeze to rip DVDs and convert the movies to be played on your Mac and mobile devices.